Changes the model for Rare Curios' welkynd stones to use that which Beyond Skyrim: Bruma provides. Currently, this patch just replaces the model patch for Rare Curios' Welkynd Stone baseid with the model path Beyond Skyrim: Bruma adds. 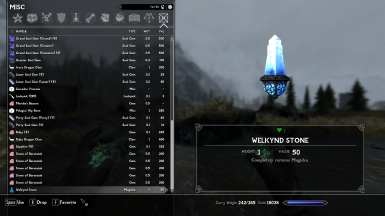 In the future, BS:Cyrodiil will likely use Welkynd Stones as a quest objective or something similar. Right now BS:Bruma's download includes two seperate Welkynd Stones, and both of which are less than ideal as the One True Welkynd Stone, from a stats perspective. When it becomes clear which Welkynd baseid the Beyond Skyrim devs decide to use, I'll instead change this patch so the Levelled Item entry Rare Curios adds for Welkynd Stones to point to that, so a Welkynd Stone bought from a Khajiit caravan or looted from a boss chest(provided you use a Bashed Patch) in Skyrim would fulfill requirements any potential quest requirement future releases of Beyond Skyrim could include. The .esp is a 'Featherweight' ESP(flagged as an ESL), so it won't count towards your ESP limit. Hence, you should ONLY install this with Mod Organizer 2, Wrye Bash or Vortex. Similarly, the mod seems safe to merge into a Bashed Patch. Just make sure it loads after Rare Curios or BSHeartland.esm, which given it has both as a master shouldn't be an issue.